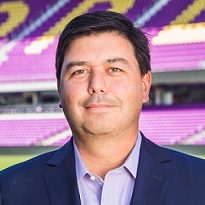 Alexandre Barreira Leitão is Chief Executive Officer of Orlando City Soccer Club, overseeing the Club’s business operations and new business ventures focused on strengthening Orlando City’s brand both domestically and internationally. He also sits on the Board of Directors for Orlando City. Leitão was most recently the owner and president of sports marketing agency Octagon Brazil, part of Octagon Worldwide – the largest global sports and entertainment agency with 72 offices and more than 1,000 employees worldwide. Prior to starting Octagon Brazil, he spent 10 years with AB InBev, the largest brewery in the world, holding various roles in the marketing department. Leitão is a recognized expert in strategic planning, helping organizations leverage premier sporting events to maximize brand exposure, sales and business development. He has managed relationships between various companies and globally recognized sports properties such as the Brazilian National Soccer Team, soccer superstar Kaka, IOC, and FIFA. Since 2001, he has successfully led projects for major sporting events such as the FIFA World Cup (2002, 2006, 2010, 2014), FIFA Confederations Cup (2001, 2005, 2009, 2013), and Copa America (2001, 2007, 2011). Leitão holds a degree in business administration from Universidade Federal do Rio de Janeiro, with specialization in Marketing from the University of California Riverside. He was recognized as one of Orlando Business Journal’s CEOs of the Year in 2017.